This requirement, which I talked about in a popular post here earlier, has solicited derision from many, including from the entrepreneurs themselves. Scott Jordan, the owner of Scottevest (Season 3) explained on a post on his site, “merely appearing on the show, whether a deal is made or not, I have to give 5% of my “business” or 2% of the profits forever to the producers. So, my appearance was not free. … Free? They make money out of every deal I make from here forward.” Losing that much of your business is something that kept many entrepreneurs from signing up to appear on the show. 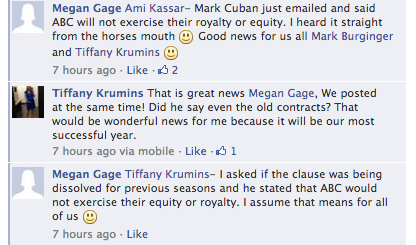 In fact, the post supposedly by Cuban says, the clause was removed retroactively, which would mean it would not be collected from those who filmed for the show in seasons one through four. It was already not enforced uniformly; in an earlier post on this site, the co-owner of SendABall reported no one from the show ever came to collect for three years. Update, October 2: Inc. has done a follow-up story about this post. Click here for that. Update 2, October 3: Although no one from Shark Tank is commenting in public thus far, several of the entrepreneurs are confirming the changes. Here’s a screen shot of a discussion among Megan Gage, who got a deal for Hot Tot, and Tiffany Krumins, who got a deal with Barbara for Ava the Elephant in Season One. Good! As it should be. I have been tying to verify this independently, but Cuban is keeping his head down, possibly because of his SEC court date. But the clause has been removed from the end credits. to the future 2 I am curious if there is a fee to get on the shark tank? I always felt like it should have been the opposite, that like Judge Judy, those who appear should at least get some compensation for providing content for the show. Whether their business benefits from the publicity of their mere appearance on the show, it can’t be considered a quantifiable benefit. Appearing on national TV also exposes them to a lot of wackos, and unlike the stars of the show, they may not be equipped to deal with that invasion into their lives. Granted it would happen far less often than to those appearing on Judge Judy because the content on JJ is so much more inflammatory.